The woman was found semi-conscious on the street between two parked cars on Goodwin place at the corner of Greene Ave, police say. Image via Google Maps. A Bushwick resident who was awoken by screams and moans in the early hours of Saturday morning called 911 after discovering a semi-conscious, badly injured naked woman on the street, police tell Bushwick Daily. 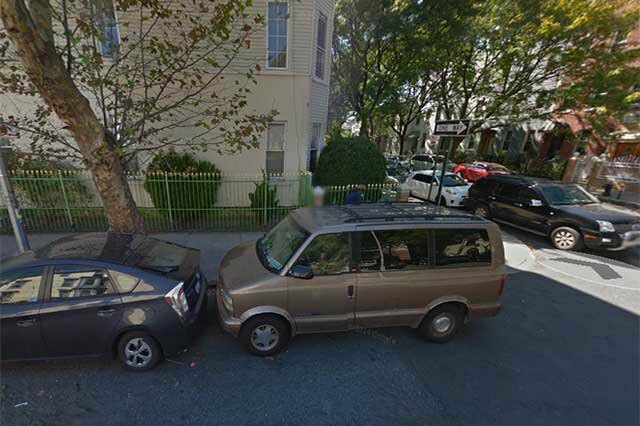 The woman, who is in her mid 30s, was found lying on the ground between two parked cars on Goodwin place at the corner of Greene Ave. Trauma to her face is among her injuries; one of her eye sockets was especially battered. The woman was transported to Brookdale Hospital, where she has already undergone surgery and may undergo more. She is conscious but has no memory of the assault that caused her injuries, police say. No arrests have been made, and the incident remains under investigation; it's unknown whether the attack was sexual in nature. This is a developing story; Bushwick Daily will update with additional details as they are received.